One of the good things about getting together with fellow sailors, this past weekend was that I was reminded of lots of nautical details. One of these details included the importance of using running backstays. Running back stays connect to the mast at the same height as your stay sail so it supports the mast at that point. 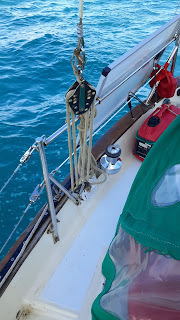 It can also help support the mast if the back stay were to fail. I hadn't used them in several months so I dusted them off this morning and you can see it attached in the center of the photo. Recently a westsail was rescued by the Peruvian Coast Guard after one of the boomkin stays parted. The boomkin jammed up against the rudder so that it was impossible to steer the boat. Anyway the only reason why the mast didn't fall down was that he had his running backstays up.